In healthy tissue, the endothelium and epithelium are lined by the glycocalyx, a layer of cells composed of heparan sulfate chains connected to proteoglycans embedded in the cell membrane. In healthy tissue, CAR does not bind to the glycocalyx and only small amounts of drugs passively diffuse across cell membranes. In contrast to healthy tissue, when an injury like pulmonary hypertension (PAH) occurs, elevated levels of an enzyme called Heparanase is released and cleaves most of the heparan sulfate chains in the glycocalyx, resulting in a largely denuded glycocalyx. 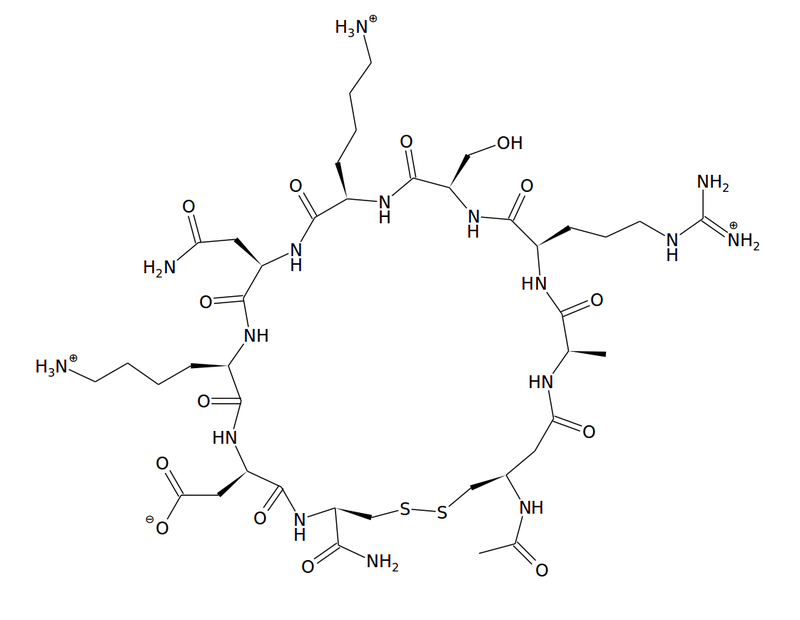 However, some heparan sulfate residues are resistant to heparanase, and these are the residues to which CAR binds. CAR binding to these heparan sulfate residues leads to membrane ruffling and lipid raft formation. These lipid rafts engulf the surrounding extracellular fluid and internalize any nearby drug molecules into vesicles inside the cell. The lower pH inside the cell causes the vesicles to break up, resulting in increased localized drug concentrations inside the targeted disease tissue. Through this mechanism, CAR preferentially targets the diseased tissue to enable the localized therapeutic effects.CAR makes therapies more effective, disease specific and decreases systemic side effects. 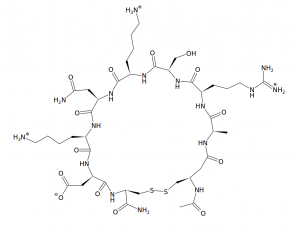 CAR peptide is being initially developed as an adjuvant for the pulmonary selective treatment of pulmonary hypertension and as a stand alone therapeutic for accelerating wound healing. CAR can also be used to selectively enhance the therapeutic benefit of cutting-edge biomedical technologies such as gene therapy, siRNA, miRNA, and antibodies. 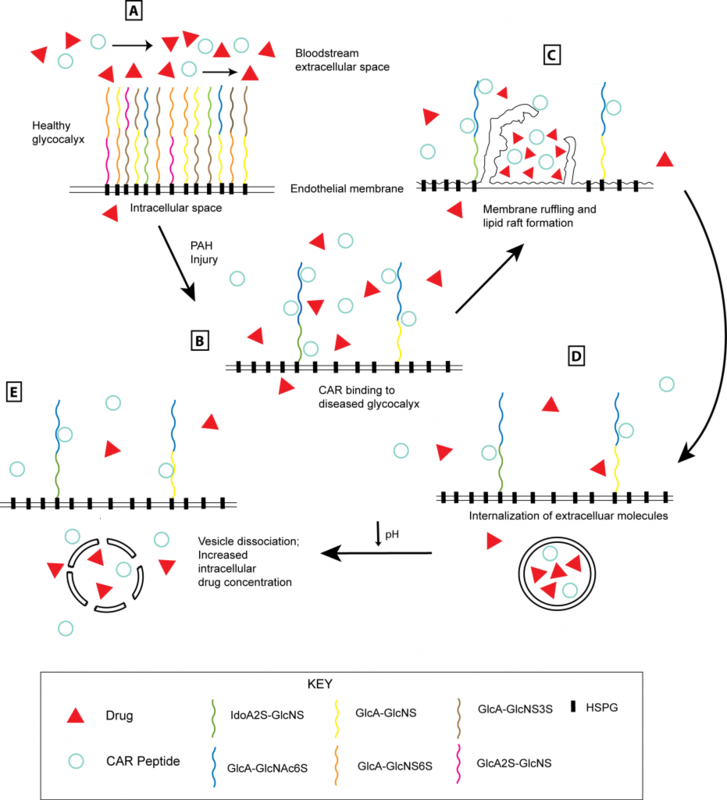 (A) Healthy glycocalyx located on the endothelial cell surface does not bind CAR peptide. Despite some drug molecules passively diffusing through the plasma membrane, the majority of drug remains in the bloodstream. (B) After PAH injury, heparanase expression increases, resulting in selective enzymatic cleavage of heparan sulfate chains and modification of the glycocalyx. HS variants resistant to heparanase cleavage remain intact, allowing CAR to bind to it’s HS receptors. (C) Initiation of heparan sulfate-mediated macropinocytosis. Binding of CAR to it’s HS receptors trigger membrane ruffling and lipid raft formation, causing an inward folding of the plasma membrane and engulfment of surrounding extracellular components including CAR and drug molecules. (D) Vesicles (called macropinosomes) containing CAR and drug molecules are formed and internalized into the cell. (E) Reduced intracellular pH causes the macropinosome to dissociate, releasing it’s contents (CAR and drug) into the cell, increasing intracellular drug concentration.